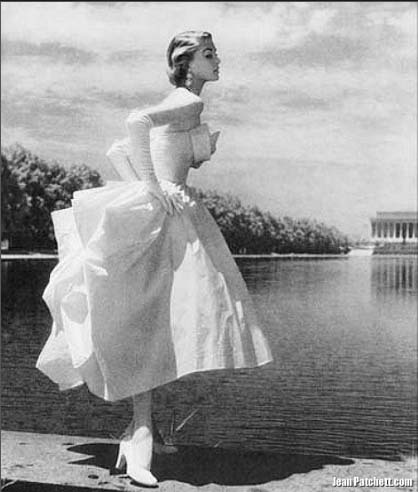 If you are into vintage fashion you most certainly have run across pictures of model Jean Patchett. Known for her striking natural beauty and trademark mole, Patchett modeled from the late 40s into the 60s. 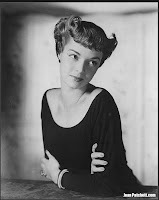 I was lucky enough to run across the official website on her on a post on supermodels on the fun blog Digs Frocks and Books. 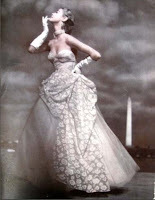 Be sure to visit the post for more on other vintage models. 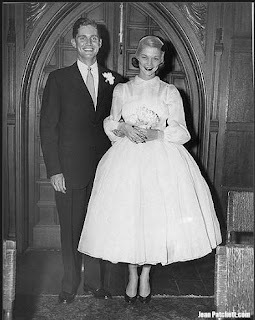 Seeing as we are knee-deep in marriage season, here are a few pictures I found on the site of Jean wearing some dresses to inspire some wonderful wedding dresses, including her own. It has been a while since I posted anything on my wedding and since June 25th is the Wedding Blog Party (hosted by the wonderful Angelic Accents Blog) I thought I would join in. It is hard to believe it has almost been a year since I married my husband, but it will be on July 18th. I've posted about a few different aspects of the wedding process, but I never touched on the time right before the wedding and some of the things I learned. First off, let me explain that I planned and organized my whole wedding. It was very Do-It-Yourself. 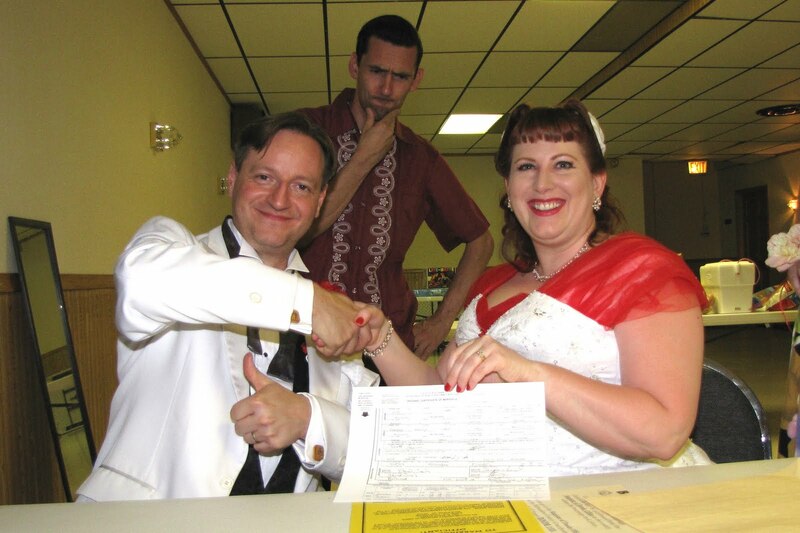 In fact, my very own band played at the wedding for 45 minutes (great price, awesome music!). In some ways it was great because if a decision needed to be made, I made it. I didn't have to run it by a planner or cross-check with vendors. I just had to ask the fiancee and get the quick nod, and sometimes not even then. 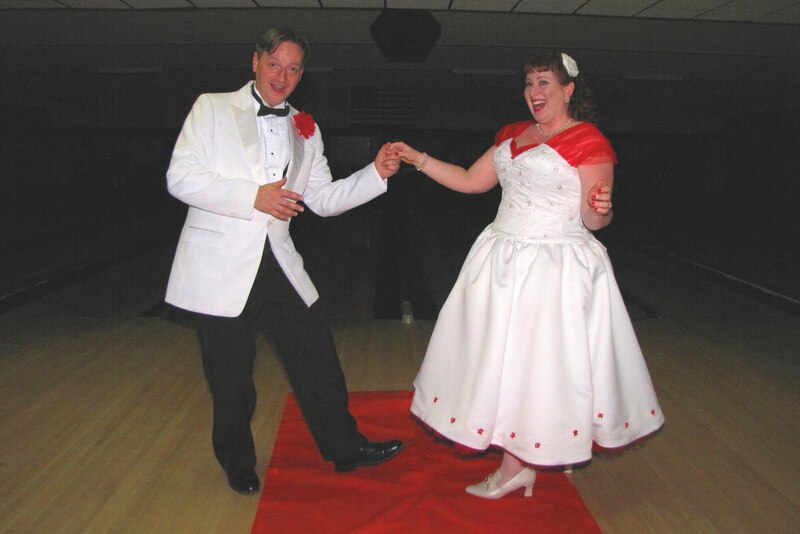 I also had a very clear idea of what I wanted- married in a bowling alley, 50s/rockabilly theme, not a lot of major fuss, but a lot of fun. And it was a lot of fun; for everyone else. Don't get me wrong, I had a great time at my wedding (as you can see from the first picture) and everything pretty much turned out the way I envisioned it. However, I found that I was incredibly unrealistic about how much could get done by a wedding party that was also preparing to be in a wedding. I got so stressed that I didn't get a chance to relax and enjoy the fruits of my labor. By the time I got caught up the night was almost over. This is why I highly recommend having a "day of" helper that is not in the wedding ceremony at all and meeting with that person before-hand (probably with the Maid of Honor too) to do a verbal run-through of the day of schedule. I was lucky enough to have another friend step in at the last minute to help with some things when we were all getting ready and generally keep things moving. I also recommend having your own dresser to help you get ready. My dresser was my Aunt Doreen, who also made my dress (or re-made from 2 dresses). She was able to remember which layers went first because I sure didn't! 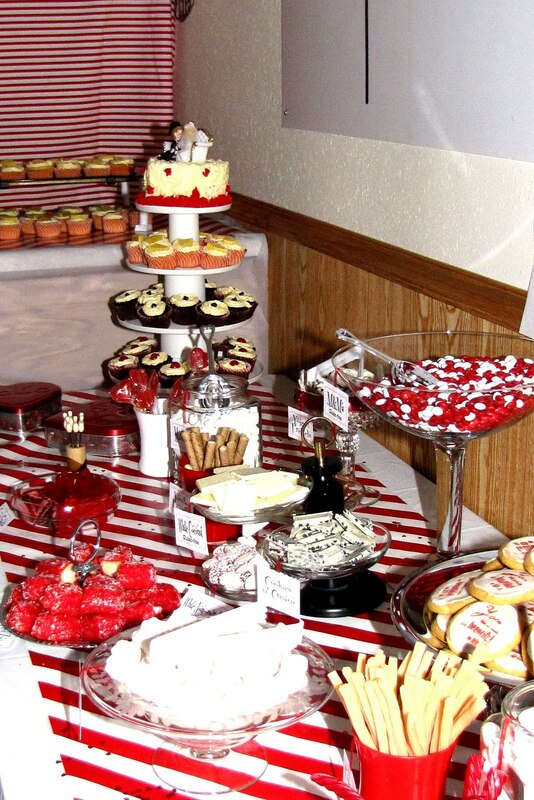 One last logistical thing if you choose not to have a caterer (we did a dessert table only), have a clean-up plan. Even if it is just a few bins and a designated car or home to take stuff to, make sure your helpers know what to do at the end of the night. Don't assume that people just clean-up and get it done. It's not because they don't care, it's because they don't want to upset you and do it wrong. The last thing you want at the end of the night is having to supervise a clean-up crew. Trust me on this one. Having a DIY wedding is a challenge, but it does pay off in the end. The entire wedding, including wedding dress, tux and bridal party gifts was just under $3,000. 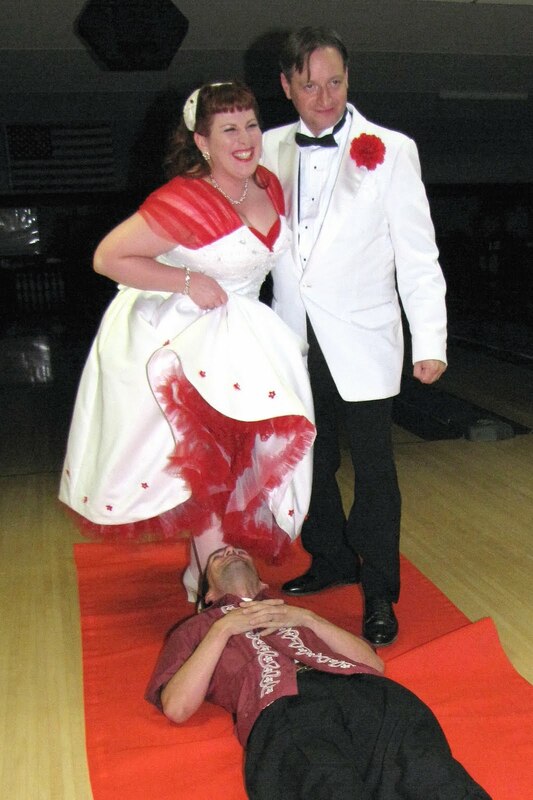 Everyone had a great time and my husband and I sealed the deal in style. 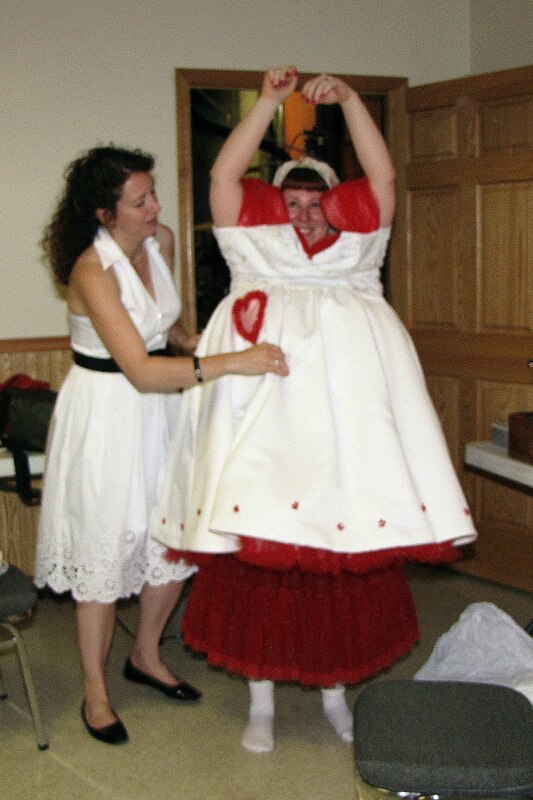 By the way, I am selling my one-of-a-kind wedding dress. Click here for more details. I think my left leg is trying to kill me. No, really. 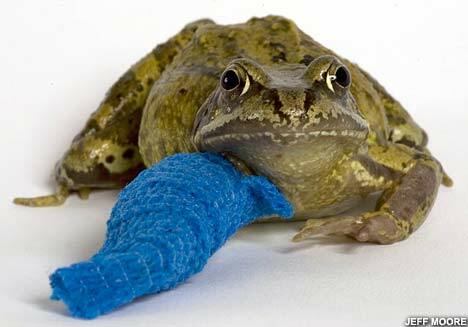 Last Friday I got bad toe infection and yesterday I went to reach for something and I felt a pop in the back of my leg and was in pain. Luckily it looks like a bad case of tendinitis stemming from an old running injury from 3 years ago and not a rupture, but I find out for sure tomorrow when I see the Sports Doc. Needless to say, my awesome vintage giveaway may be postponed until next week when I have a better handle on my foot situation. BLEH. The results are in and the Vintage Grab Bag giveaway won by a landslide. Over 50% of you prefer a little bit of everything and that is what you will get! I will post my giveaway in the next day or so. It will be a doozy so keep your eyes peeled. I have been hinting at a giveaway for awhile now. I am having problems deciding on what kind of giveaway though. Since you all will be the ones entering, I thought I would let you vote on the giveaway you like best! THE POLL IS NOW CLOSED. You can view the results here. Thanks to everyone who voted and good luck in the giveaway! I just finished a fun apron swap hosted by the awesome Hot Mama Apron Swap blog. The theme was pin-ups so you know I had to do it! I have a ton of apron patterns, so I like to do these swaps so I am forced to get going on a pattern since it always helps to have a specific goal. This one was was a little bittersweet though because my beloved Singer 6268 sewing machine died on me and may not be fixable (I'll hear more by the end of the week). So I had to finish the apron with a borrowed machine as my back-ups are also waiting for service since I am a poor grad student. To the above right you can see the pattern I used and to the left the end product. 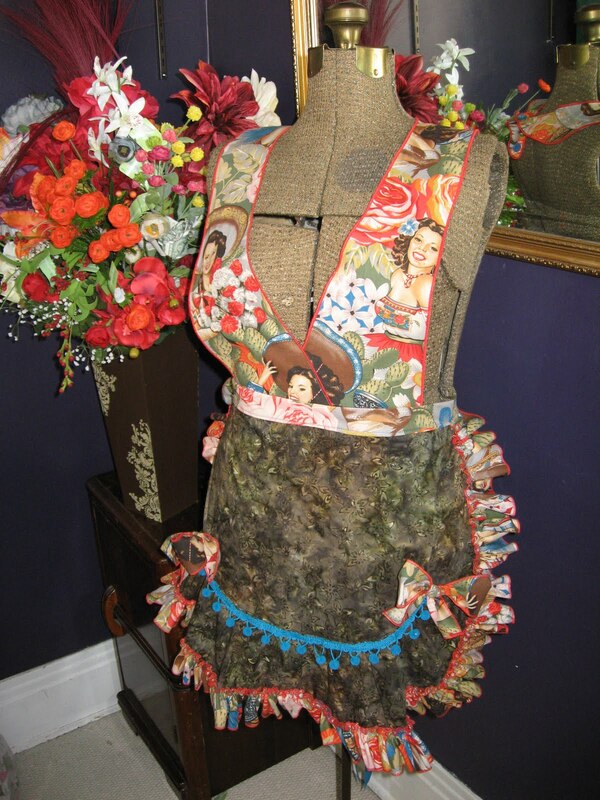 I originally wanted to add a pocket at the bottom of the apron where the ball trim is, but due to the way the pattern is put together (the pattern is slashed at the bottom and an extra ruffle piece is laid in, then restitched to the rest of the apron) the pocket kept making the apron lay weird. 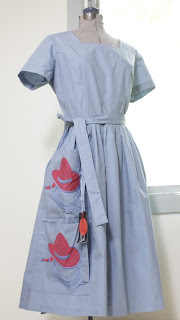 I think I know how to fix it when I make this again or I may just add on a top-stitched pocket. The instructions also call to add the bib piece by top-stitching to the waistband, instead of sandwiching it, which I will definitely modify next time around because it is just weird to me. I also think I will line the bib pieces, which the pattern also didn't call for. Since this is a 40s pattern I get the minimal use of fabric, but lining the bib will give a cleaner look and strengthen it. Anyhoo, I am pretty pleased about this first try. I overshot on the ruffle length so there is a ton of yardage in them there ruffles, which actually works on this apron. 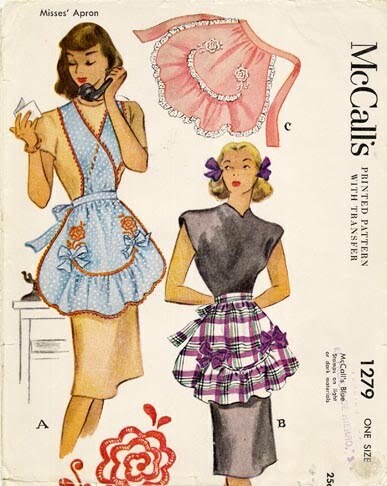 I also adore ball fringe and the matching fabric bows. If anyone has a tried and true way to tie bows- I'm all ears. Mine turn out alright, but I know there is a better way. 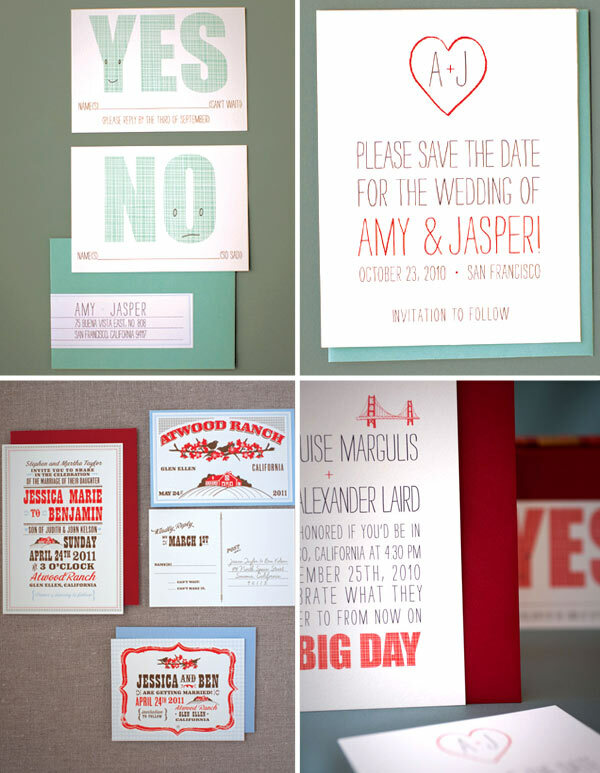 My favorite wedding blog Ruffled is having a digital wedding Save the Date giveaway from awesome online designer Hello Lucky. If you don't know Hello Lucky, you will love their designs. One of my favs is the rockabilly design in the lower left corner. Ruffled will pick TWO winners, but the giveaway ends June 13th so get on over there and enter! I just got a notice that Mode Merr is extending a 20% off sale to June 15th (use the code happiness). 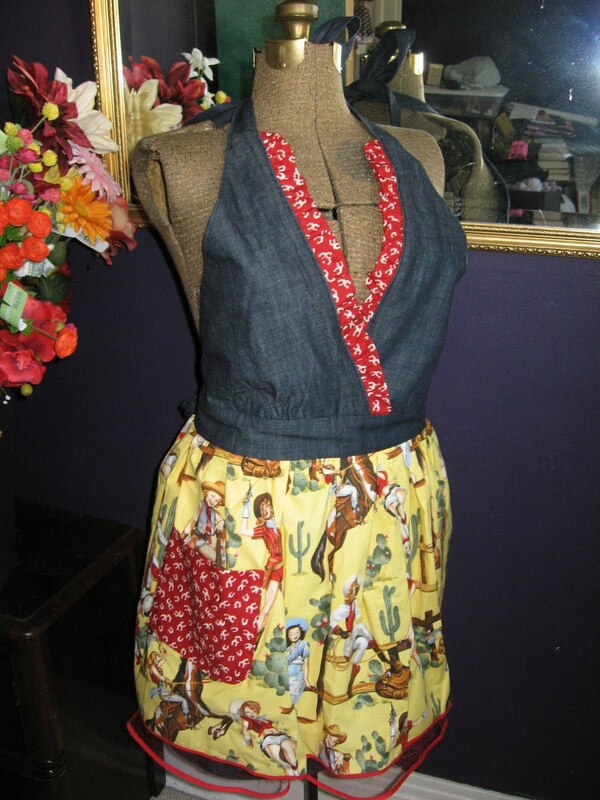 So if you were thinking about picking up the perfect rockabilly skirt, now's the time to get on that! And remember, sizes run up to a size 46" bust and 49" hips! I haven't posted about vintage music for a while, so here's a quick blurb about an online streaming radio station I discovered a while back called Radio Dismuke. They stream 20s & 30s popular music and I have discovered quite a bit of tunes to use for my hot jazz vocal trio Bootless Betties, that's for sure! 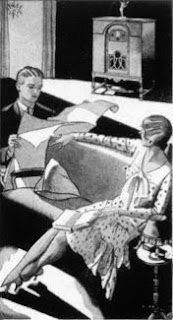 The man who runs it is incredibly knowledgeable about the music and has a discussion forum for 20s & 30s music lovers to communicate and post questions about the music (which he often answers himself). There is also a blog, although it is not updated very often. However, it has a listing of other resources for music of the same era so it is worth a look-see. I listen to the station through Live365 (I find it is more work friendly). So to save you a step, you can click on the link below to take you directly to the Live365 station. FYI- click on the yellow play button to start the station and there is always a short commercial at the beginning. ENJOY! I have discovered a new blog for vintage loving men and it is pretty sweet. 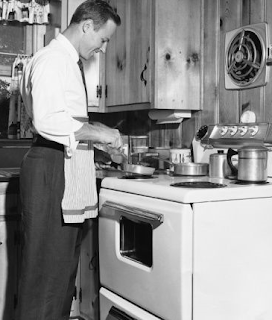 It is called The Art of Manliness, dedicated to "helping men be better husbands, better fathers, and better men. In our search to uncover the lost art of manliness, we’ll look to the past to find examples of manliness in action. We’ll analyze the lives of great men who knew what it meant to “man up” and hopefully learn from them. And we’ll talk about the skills, manners, and principles that every man should know." Now this may seem to be a bit macho on the surface, but in reality this is a great site run by a husband and wife team. It has tons of helpful tips and funny articles, such as Finding Your Calling Part I: What is a Vocation to How to Survive a Shark Attack. I really enjoyed the article on How to buy a Used Car and it was extremely thorough. I highly recommend visiting this site whether you are of the male persuasion or not. It is chock full of vintage and retro goodness and has nifty pictures throughout the site. Have fun! If you are addicted to Swirl dresses (and who isn't?) this dress is pretty sweet. It is a tad bit more expensive than the items I usually post about, but it is new with tags and in excellent condition. A special thanks to Yesterday Girl for tipping me off to this awesome dress's existence. And yes, those are embroidered cowboy hats. 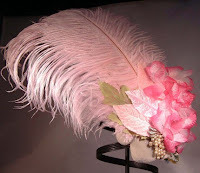 I go through stages of inspiration for my hair accessories. My last big inspiration was movie musicals, specifically the movie Singin' in the Rain. 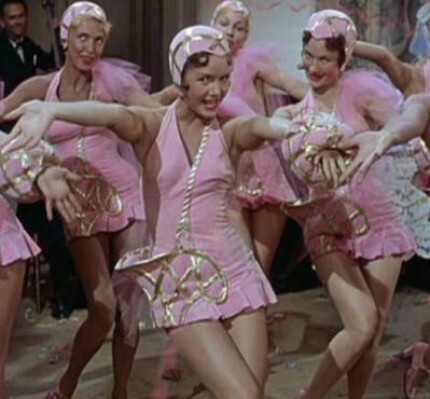 The hair clip on the right named Broadway Melody was inspired by the scene where Kathy Sheldon (Debbie Reynolds) sings Dream of You towards the beginning of the movie, right after she meets Don Lockwood (Gene Kelly). 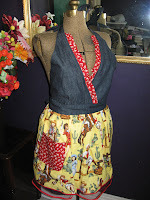 Here is a picture of what Kathy was wearing that just made me go gaga and I HAD to create something. I know the girls aren't wearing feathers, but the movie is supposed to be set in the late 20s, so I went with a more flapperish style based on the color scheme. Plus, most of the clip uses vintage millinery and jewelry, so I didn't fret too much about a litral translation. I suppose that is the point of being inspired, right? I have a few tried and true movies that I put on when I am in a creative slump. Some I watch for specific time periods, others I watch for the visual impact they give. You'll notice quite a few are modern films set in a different era. I find it helps to have the color to reference, but I do often watch black and white films and documentaries. Of course, pictures and screen shots help too. One of the best websites I have found for this is The Costumer's Guide to Movie Costumes. 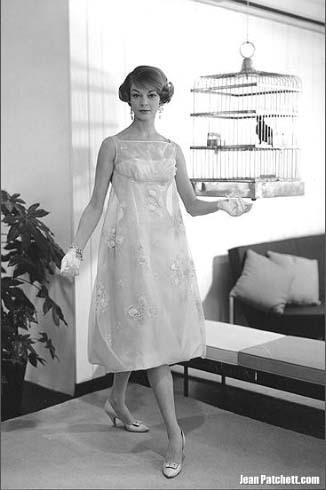 Not only do they provide decent pictures, they also give links for costume studies and exhibits. So, there is the preliminary list of my creative inspiration films. I'm sure I left a few out. I can't wait to hear about more from you!